The salary doesn’t tell the whole story. Unikrn did a recent podcast regarding player salaries, and with that podcast they released the contract of an NA Challenger Series Player. Trevor “Stixxay” Hayes played for the challenger team “CLG Black” for the duration of Season 5 from January 2015 until the end of the challenger series. The release of his player contract has provided a lot of insight into the total compensation and benefits a player gets from an organization when they agree to join. The most important thing to note is that the salary is not the biggest benefit given to the player. The salary that Stixxay received for his services on CLG Black was $700.00 a month or $8,400 a year. If you divide this number into a normal 40 hour work week you end up with an average of $4.75 an hour. Of course professional League of Legends players can spend way more than 40 hours a week playing the game. They can go up to 80 or more hours if you include time spent playing solo queue, scrimming, and analyzing vods. This might produce outrage for most people because the rate given here is below the minimum wage, however the salary doesn’t tell the whole story. By spending some time actually looking through this contract there are plenty of tangible benefits that Stixxay was getting from CLG. The most obvious one that is included in the contract is housing. CLG stated that the cost of housing was approximately $10,000 a month for all 5 players in total. So Stixxay’s portion was $2,000.00. A quick search for homes for rent in Los Angeles reveals that a 6 bedroom house can go anywhere from $8,000 to $12,000 or more depending on a variety of factors such as location and amenities and quality. $2,000.00 is a very realistic rent for someone living in a house like this in LA assuming a few things. First of all the player should have their own room if the value of the rent is really this much. Or they should at least have enough equivalent space to a room to themselves in their section of a room. Secondly the player should not be paying any utilities. Gaming houses definitely do take a lot of energy. It’s really unlikely anyone in the house sets the thermostat to anything other than 72 degrees at any time of the year, and the PCs and lights are running all the time. It’s assumed that when CLG assigns that value for housing they are covering the cost of the renting the location as well as utilities and internet connection fees. So now the total compensation that Stixxay was receiving from CLG jumps up to a modest $2,700.00 a month. A 40 hours work week puts this at a very reasonable $16.88 an hour. This kind of payment is similar to what a 20 year old college intern might make at a reputable company with a good program. However, this is still not the full benefits package given to the player. 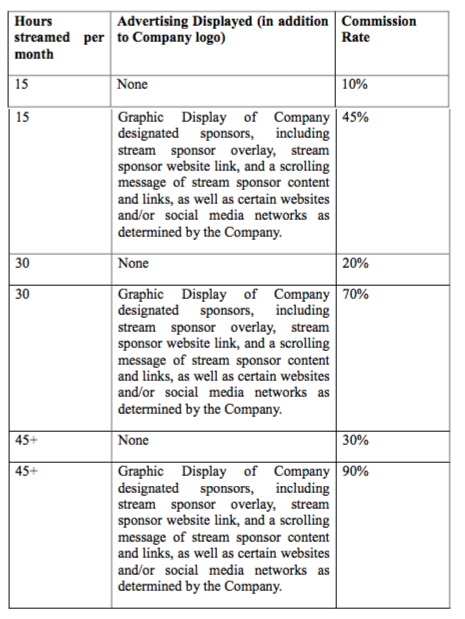 The contract also mentions streaming as a source of revenue. The player, as long as they meet a few requirements, can receive up to 90% of all revenue earned from streaming. So in theory the total compensation and salary a player earns can get infinitely higher if they market themselves correctly and build a strong fan base on their stream. A realistic assumption to make might be the player gets an additional $100 a month. They might not be an extremely well known player, but they have a dedicated following and their stream does reasonably well. In addition to streaming, another source of revenue that exists for players is the ability to acquire an individual sponsorship. This is different from the sponsors that already exist for an organization. Counter Logic Gaming may have a deal with Razer but the player isn’t directly earning revenue from that. However if a player’s stream gets sponsored by G2A or Kinguin or a similar company, the player is entitled to ALL the revenue that their sponsorship gives. In addition to this, CLG will actually pay the player $0.50 for every $1.00 that they get in revenue from an individual sponsorship deal. So CLG is encouraging their players to acquire these deals and is giving them a fairly generous incentive. Now the problem with these sponsorship deals is that many young new players may not understand what it takes to get these. On top of that no one outside of the industry really knows how much these deals pay. But there is definitely a lot of untapped potential here for a player to earn. For Stixxay’s case, sponsorship revenue and streaming will not be included in his compensation because there is a lack of information. What is known about Stixxay’s streaming is that he doesn’t get a large number of viewers to assume he is earning a lot from the stream. Sponsorship deals are also a big question mark for Stixxay. So he is still at the initial compensation of $2,700 a month. For someone playing in the minor leagues this is still a very reasonable payment. There are additional monetary benefits that CLG offers to their challenger players. The most obvious is their coverage of all travel expenses. They will also reimburse players for baggage insurance with proof of receipt. CLG will also cover all entry fees to all events the player participates in. As we can see from reading through the full contract, the value that goes under “Salary” is only the corner of a full image, and without an understanding of the true value an organization brings to a player it can be very easy to assume that organization are mistreating their players. Of course it would be great for a player to earn more, but it does not appear that players are being mistreated or abused by an organization like Counter Logic Gaming, and in Stixxay’s case he has really benefited from his time on CLG because now he is playing the major LCS where he will definitely receive a salary hike and much more exposure for future revenue options.